Getting highlights for black hair is easier than most other base colors since black seems to work with all other shades. Whether you prefer bright or dark hues there is an option to choose from but just like any other highlights you have to choose something that is suitable for your skin tone. Apart from this, you should also go with a pattern that will make your highlights look neat and natural. 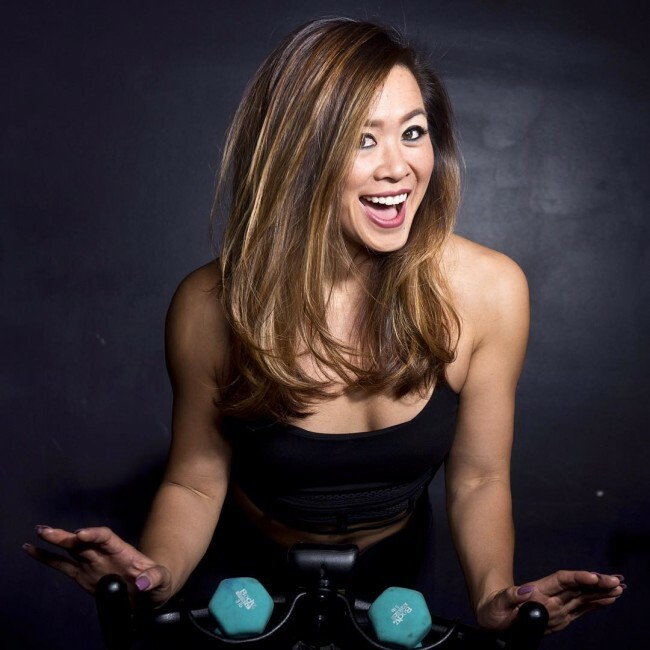 Regardless of your personal preferences and tastes the following 55 hairdos with highlights will give you some ideas on what you can do to your black locks. 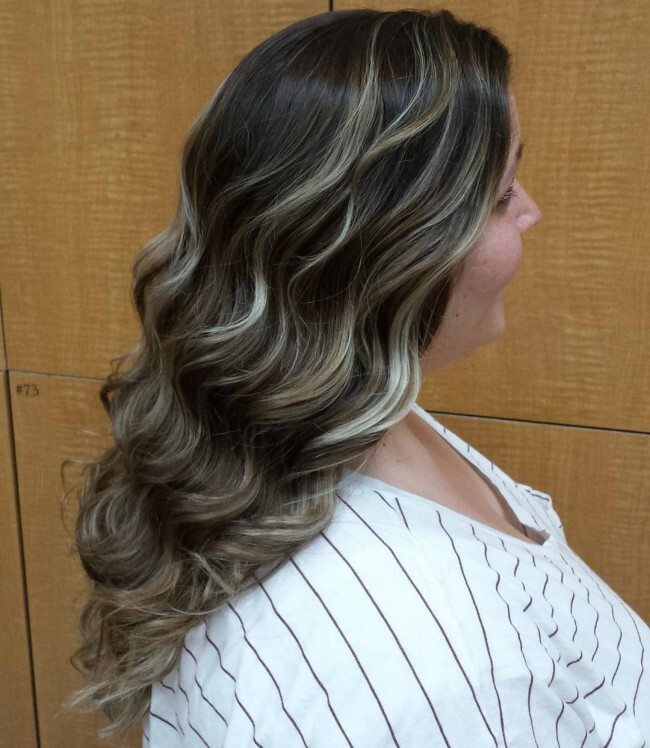 The colors in these long wavy locks blend in to create a perfectly highlighted look for black hair. 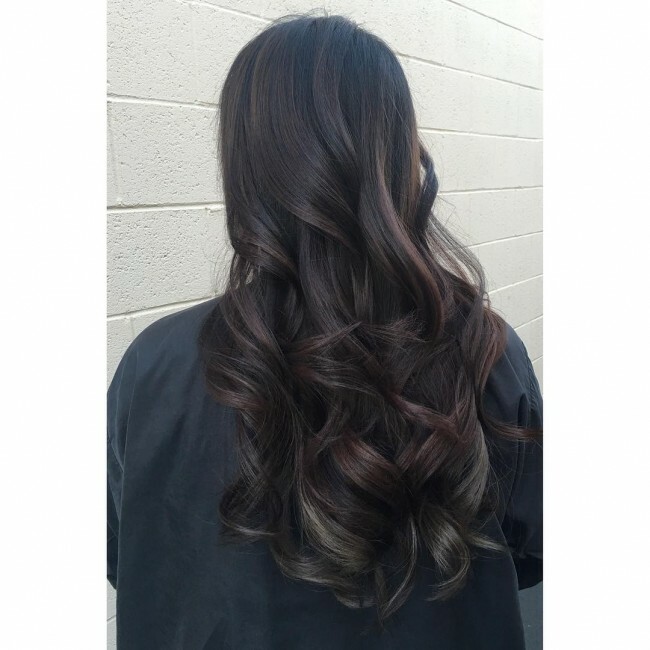 It uses different shades of brown and they are dyed using a Sombre pattern that involves transitioning from a dark base to a blend of various shades of brown on the lower wavy section. Straight hair is perfect if you want to add some color to your style as it will make the hues more visible than wavy and curly locks. 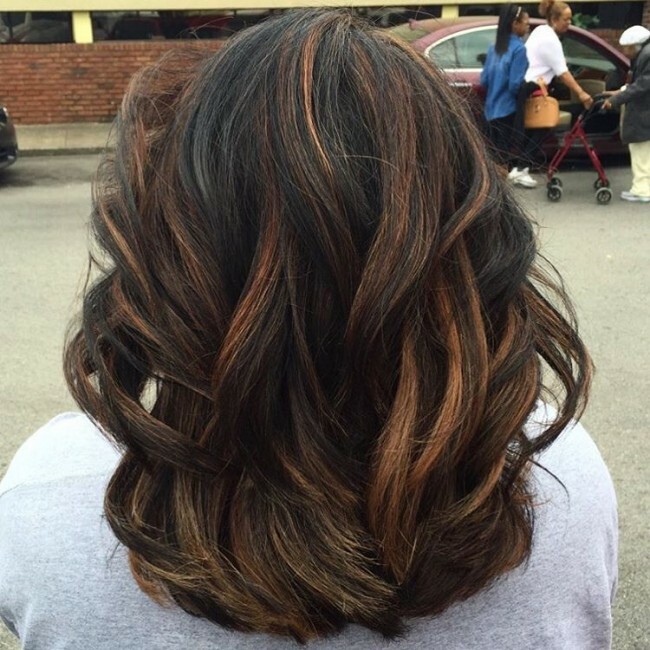 In this particular style, a subtle shade of brown is blended on the black hair to create some amazing streaks. The shine on the design and the neat side sweep styling also help to enhance its appearance. You can never go wrong with chocolate brown as it is one of the few shades that seem to work for all women. 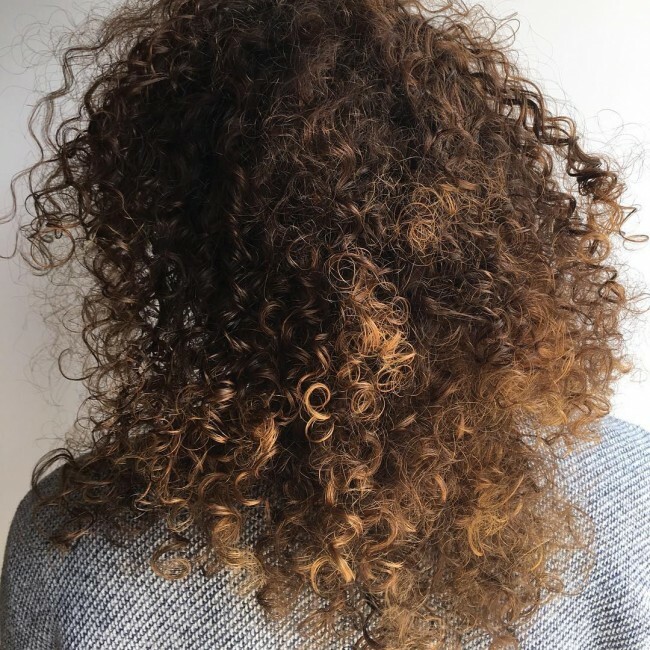 In this design, it creates a perfect color blend with the natural black tone of the hair and also helps to make the curly half of the hair look detailed. The overall appearance of the design is made classy by the creative side part and face frame styling. Sometimes it is not easy to choose between different shades, but the best thing is that you can use many of them to create an eye-catching design like this one. 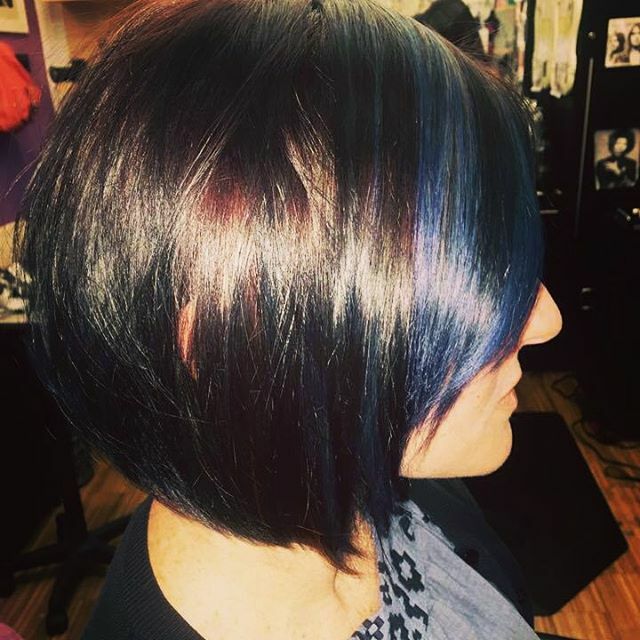 The layered locks in this Bob are splendid, but they would probably not look this attractive without the pink, purple and blue hues used to highlight them. 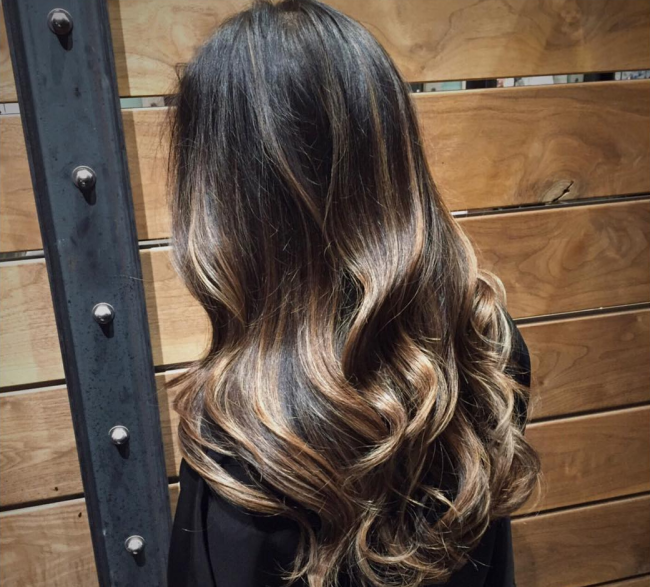 Carmel is a lovely shade, and it looks even more stunning when used on some nicely textured wavy locks like these. Although it is a common hue you can always make your streaks look distinct by painting them creatively and one way to do this is to use a balayage technique like in this headdress. The haircut in this style is one of the things that will catch the attention of most people. However, there is nothing fancy about it since it is just an ordinary bob cut with a slight asymmetry and a face frame styling. And so the fabulous ash gray highlights are what makes the headdress look unique. 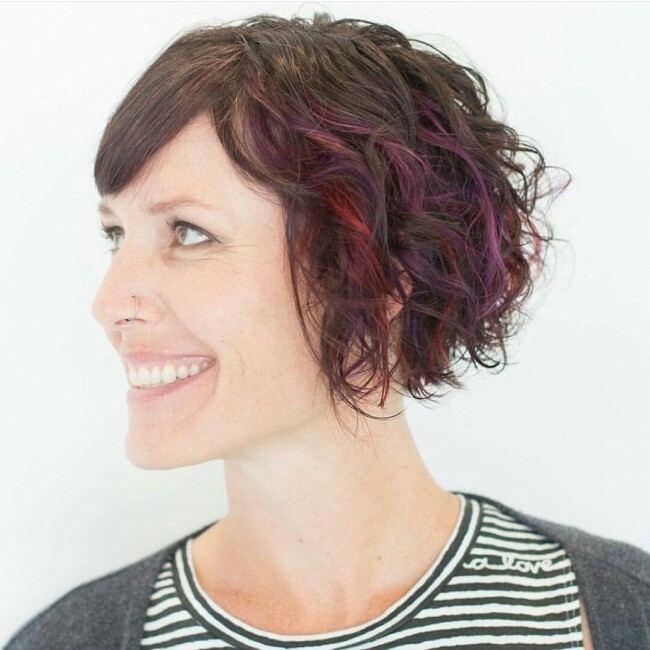 If you already have a lovely cut and style like this side parted and layered design, then you do not have to use too much color to spice it up. 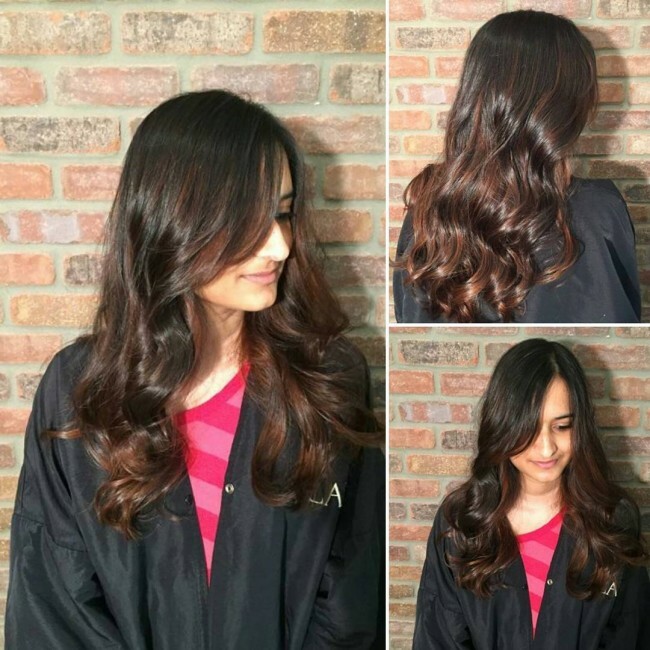 Something simple as partial chocolate highlights will help make your layered strands more attractive and trendy. Your inventiveness is your only limitation to the colors that you can have on your strands. 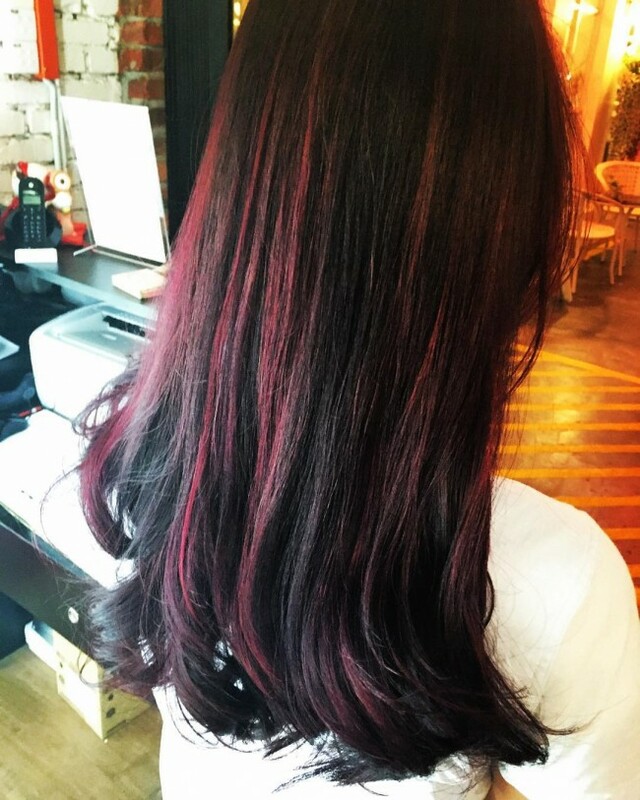 This sweet red wine hue proves this beyond any doubt as it looks perfect on the straights locks. The color blends in with the natural black shade to create a design that one can only describe as amazing. Blowouts are very common due to their ease of maintenance and attractive appearance, but you can make yours distinct with some color. 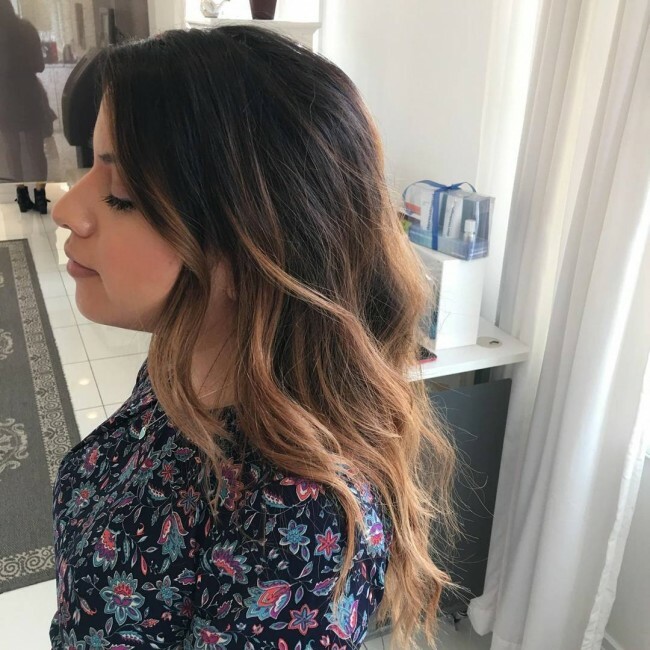 Hand painting your blowout locks is one way to do this and if you use blonde and brown shades like in this particular one you can be sure of an eye-catching look. These brunette locks have everything that a woman needs to have a perfect hairdo, and they include an excellent trim, texture, and tone. The color is the center of attraction in the design, and it is a Sombre pattern that comes from introducing dark brown and caramel on a black base. The length of these waves and their incredible volume and texture makes this a top notch headdress. Although they would look fabulous in their natural black shade, the blonde hue helps to spice them up and to make them look trendy. 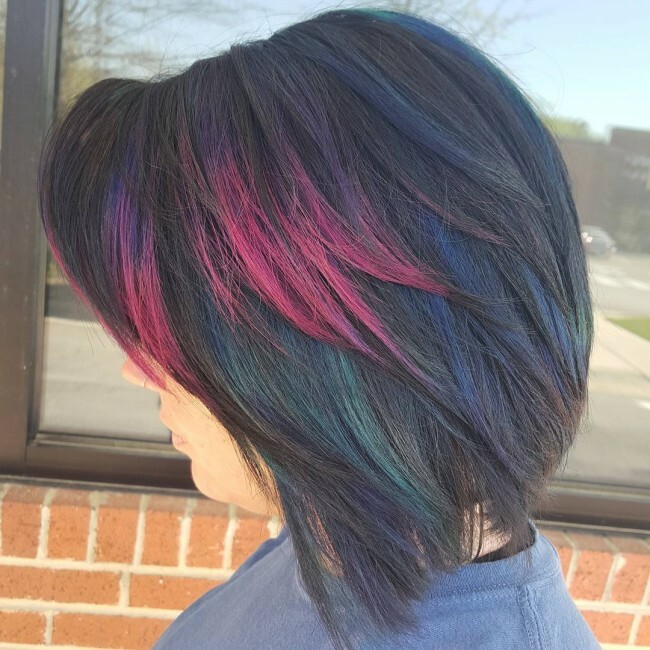 The choppy shoulder length hair in this design looks fantastic thanks to the creative color pattern. 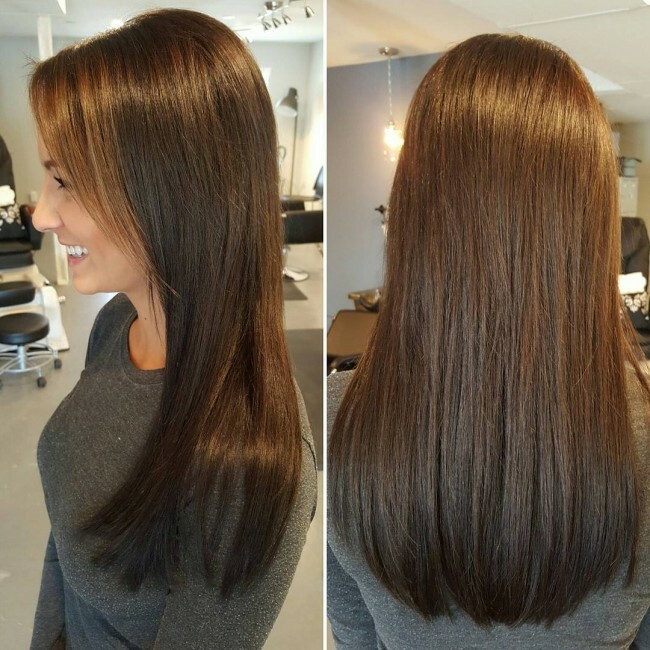 Although the design involves a smooth transition from a dark base to bright tips, the color melt between the dark brown hue and black is what makes this a top notch style. Hand painting hair or balayage is now the most common dyeing technique, and the beauty of this headdress shows just why it is popular. 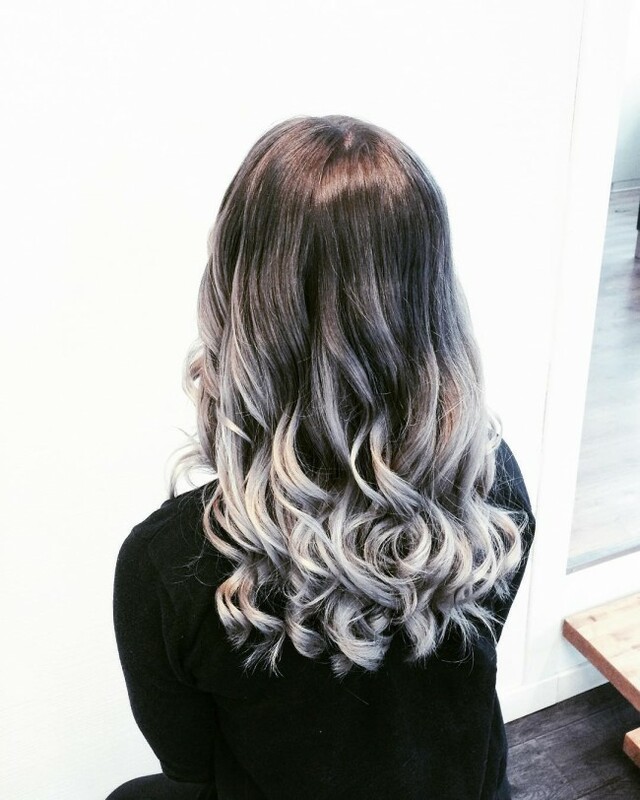 Although the hair has some lovely curls and a neat cut, the introduction of the grayish blonde tone is what gives it its beauty. The ombre design that involves a drastic transition from a dark base to the grayish blonde ends also adds to the beauty. The two-phase braid is what will catch the attention of most people looking at this headdress. Although it is perfectly done and finished with a cute fishtail, there is still much more to the design than just the braid. The locks have some lovely golden blonde highlights that help to add some detail to the black hair, and this is also what makes the simple braid look fabulous. 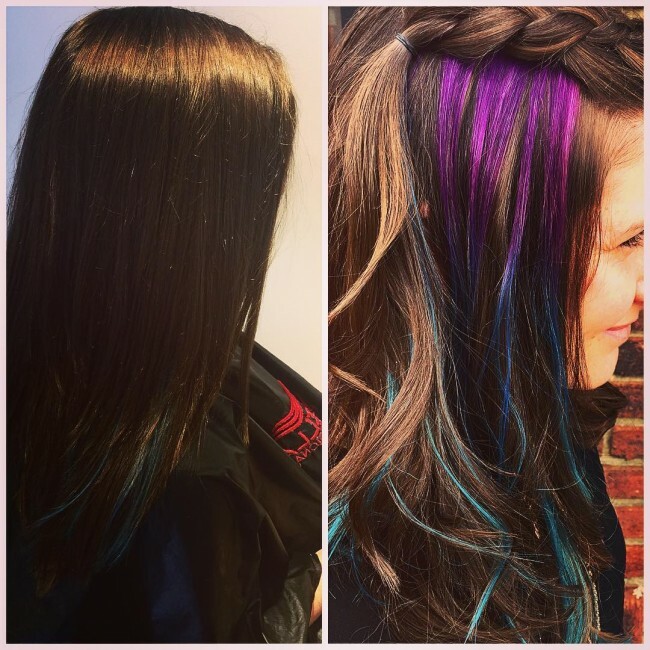 Straight locks are easy to color, but you still have to choose the right hues if you want your headdress to stand out. 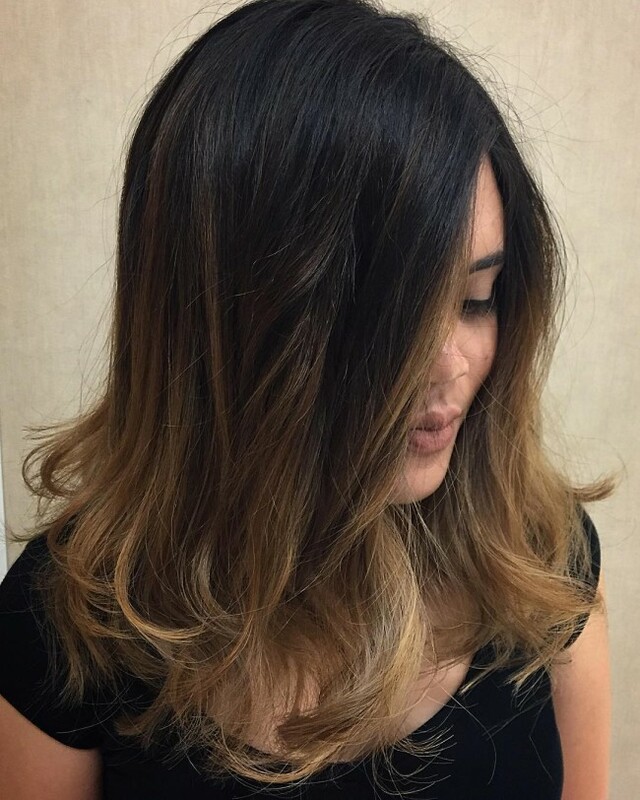 The golden hue in this design is a perfect example of a beautiful shade that you can use on fine straight locks as it helps to give them a fantastic shine. You do not have to get dazzling colors or make it look so obvious that you have a dye job to look good. 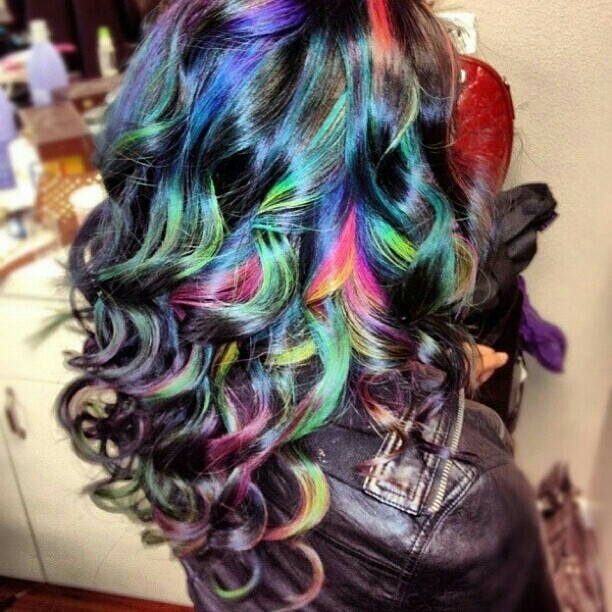 In fact, most modern women prefer a color melt since it is moderate and does not appear like an obvious dye job. However, even as you go for a color melt you should use excellent hues and for black hair, platinum and caramel are perfect especially if you have straight hairs like these. Peek-a-boo is very trendy and not as widespread as other dye patterns. They look good for most ladies especially those with black hair. If you have a short cropped curly hair like in this headdress, this modern coloring design will also work well for you. However, just like any other design you should choose some good shades such as purple and red. This headdress is another example of a lovely peek-a-boo, but this one is more inventive than others. 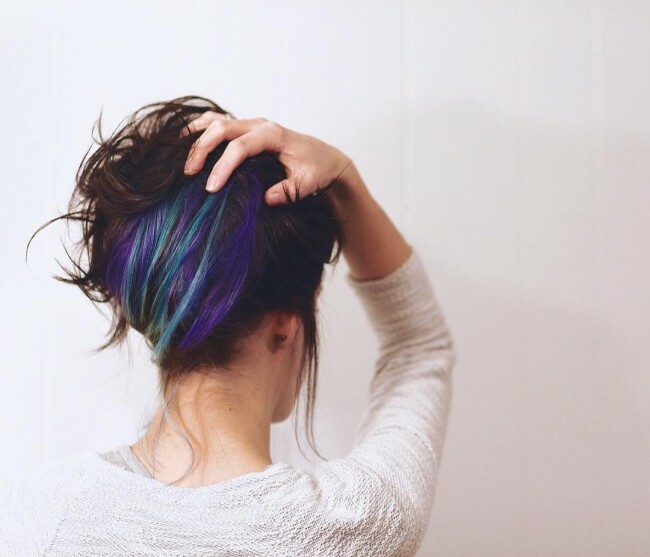 One of the things that make it stand out is that it uses multiple colors that include purple, blue and blonde. 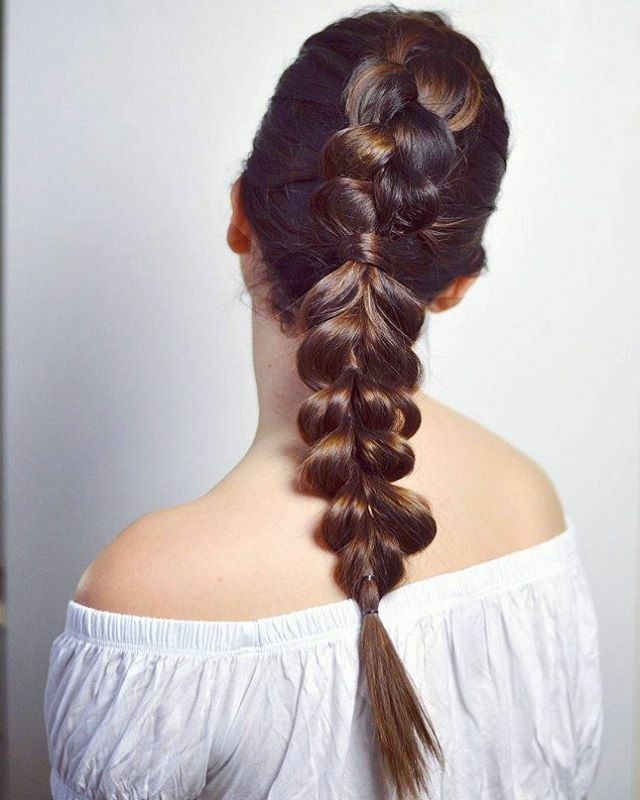 The styling is also unique especially due to the lovely side braid introduced to expose the colors below the black strands. The trendy look in this headdress comes from combining several things into one design. 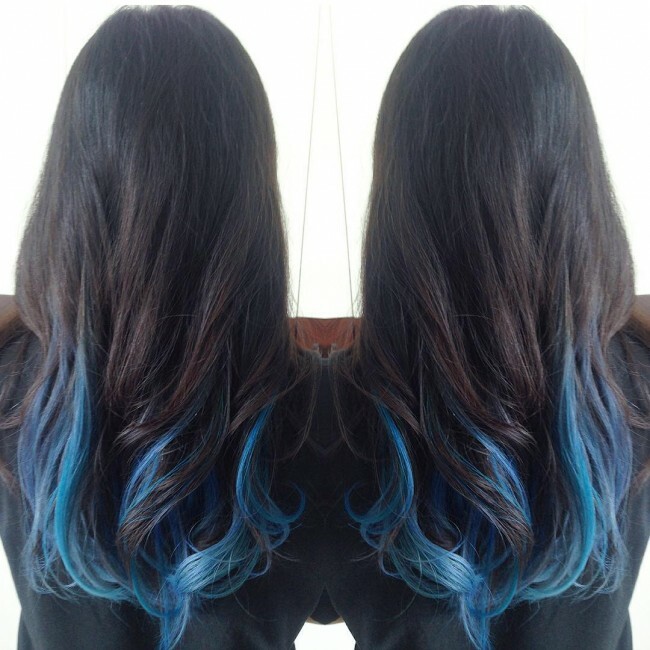 It starts with long locks with a lovely blue ombre color pattern. You should then create a large Dutch braid and the finish by rolling and pinning it on the crown to create the reverse braid design. The different shades of blue on the hair are what make this an exquisite design, and they help to create a lovely pattern on the reverse braid. If you have an excellent dye job, you will not have to do any fancy styling to look fabulous. A simple side sweep or brush back is sufficient with a lovely hair tone. The sweet ombre in this design that involves moving from black to caramel is enough to give a woman an elegant look. The best thing about color is that it makes any hair look fantastic no matter how short or long it is. 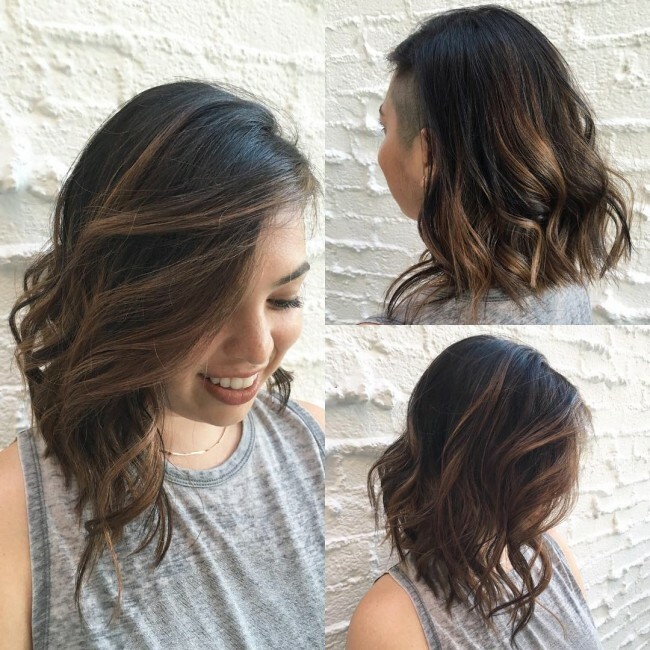 This short crop cut is very sweet especially due to its style. The styling also helps to expose the cute caramel highlights on the short strands. Black forms a fabulous base color and the best thing about it is that it can transition to any bright or dark tone and still make you look outstanding. In this headdress, it transitions to a warm brunette shade and makes the wearer look very classy. 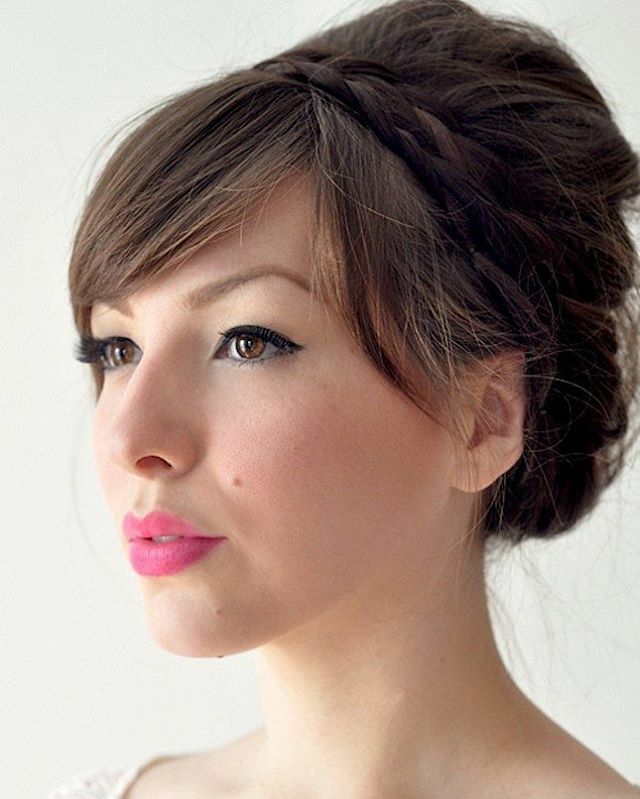 However, the strands also have some lovely waves and an undercut that also help to make it look top notch. 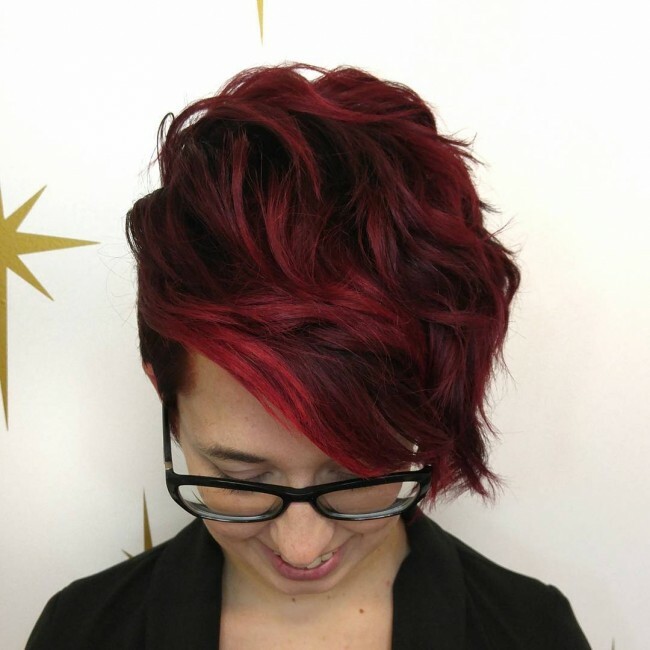 The color in this hairdo is perfect but what makes it look this good is the haircut, and it involves leaving long asymmetrical bangs on the crown and tapering the sides and back short. Color choice is always important for any headdress and in this style it is a sweet black to light brown ombre. You can be confident of an eye-catching look if you hand-paint your black hair with a sweet chocolate brown shade. In this design, it is hand painted in a Sombre pattern to create a smooth transition between the black and chocolate hue in the long bob. 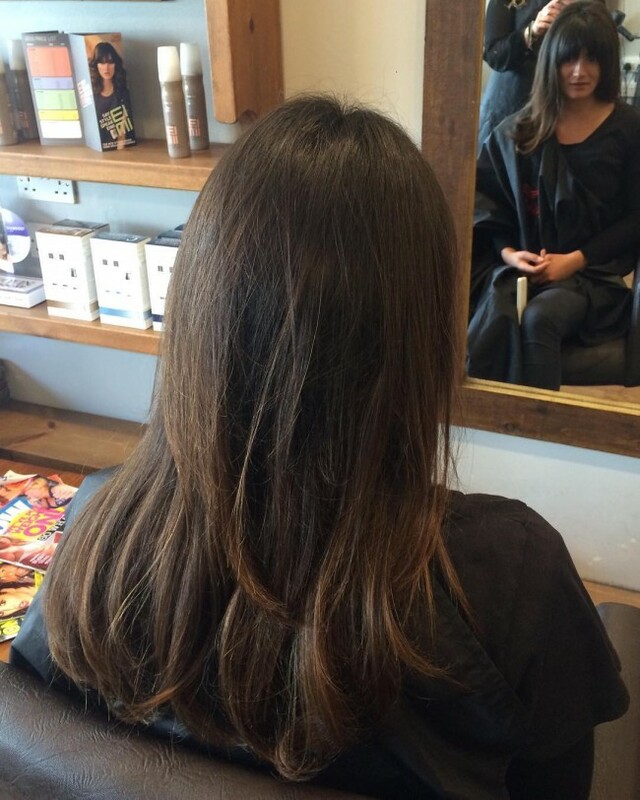 Apart from this the locks also have a fabulous shine that helps to enhance their appearance. Curly strands are as lovely as straight or wavy ones and contrary to what most ladies think it is very easy to style. 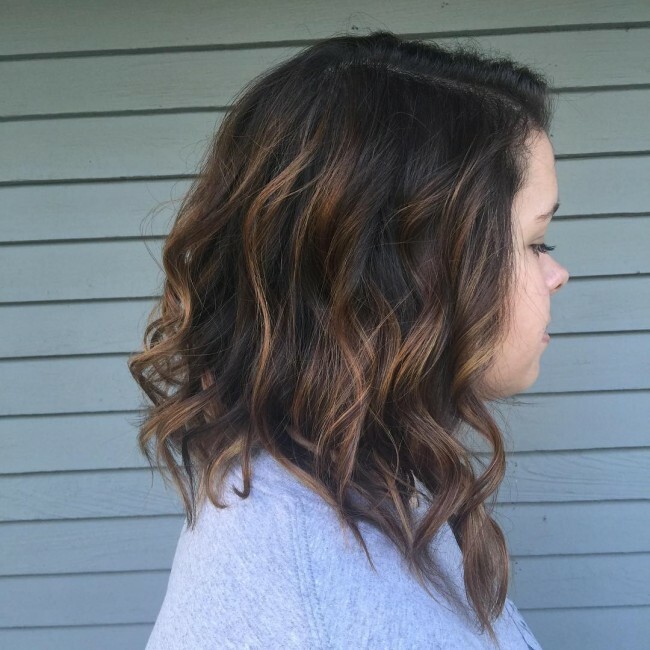 The small spirals in this hair are as beautiful as one can wish for and apart from their creative cut they also have a fantastic brown shade that gives them that sun-kissed look that most women love. 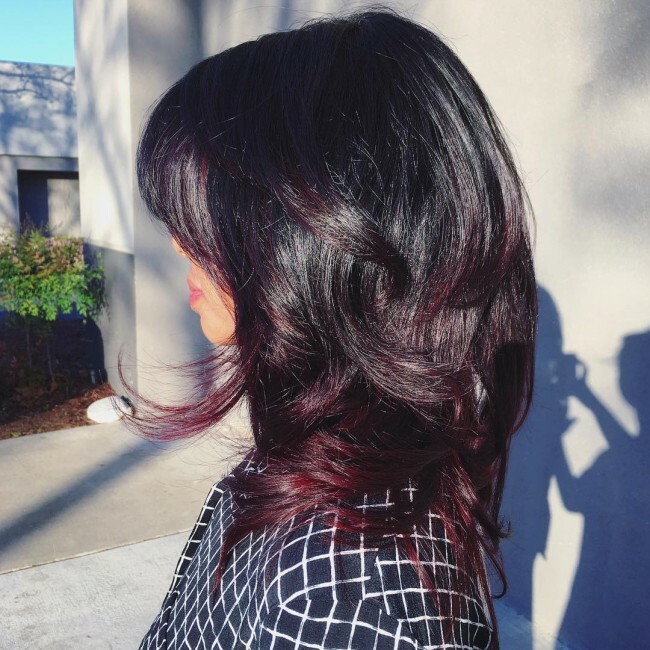 Burgundy is a lovely hue that will make your straight strands look exquisite and classy. 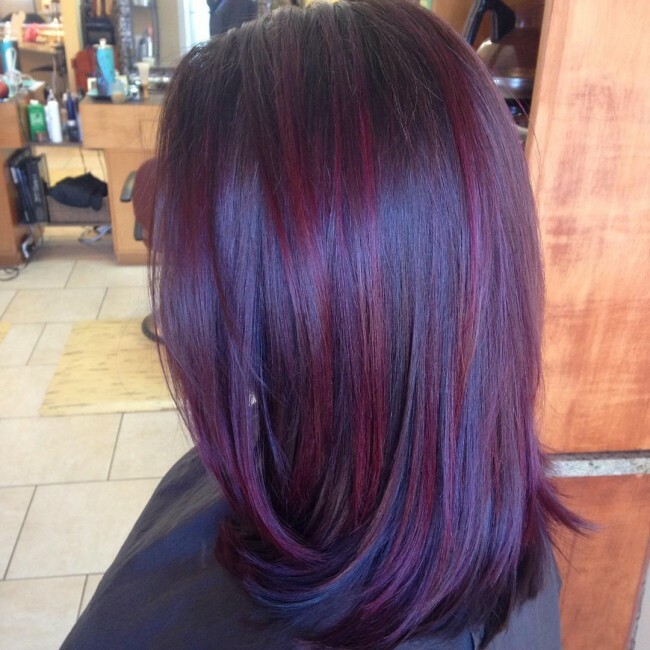 In this design, the burgundy streaks blend in with the natural black tone to create a perfectly highlighted design. Apart from the color the shoulder length locks also have some lovely blunt cuts that also add to the overall beauty of the headdress. 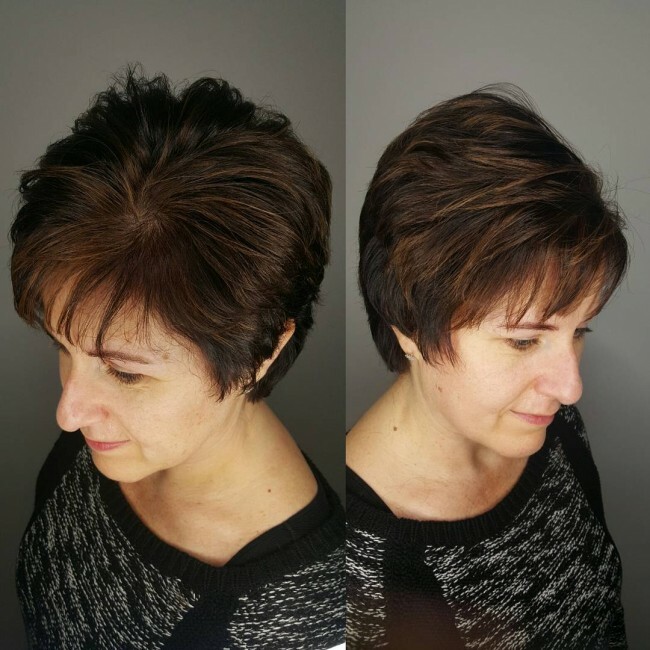 This short bob has a lovely texture, and it is layered to give it an extra volume. 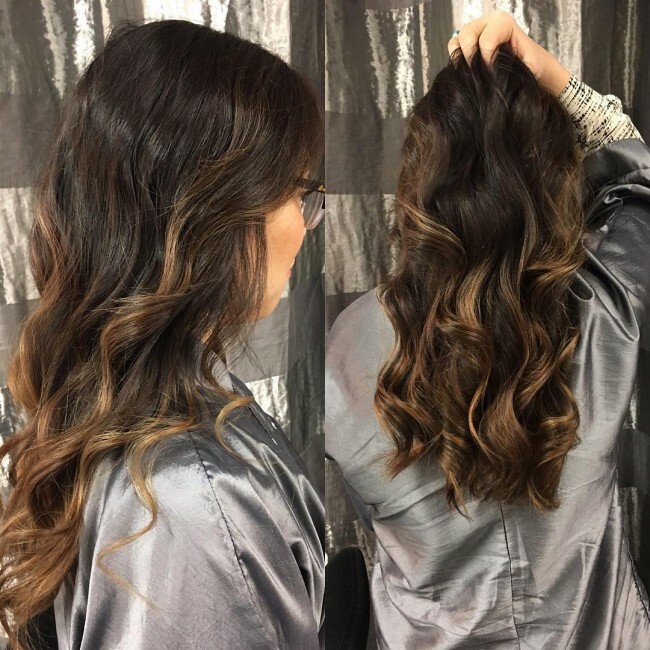 It also has an attractive wavy pattern that helps to make it look trendy, but the partial brown highlights are what give it the distinctive look. The partial highlights are more concentrated at the front section, and they create a peek-a-boo like design when the locks are layered. Few other colors blend in as perfectly as dark brown and blonde. The hues look perfect on black hair, and they are also very easy to combine, and it’s hard to go wrong with them. In this design, they accentuate the textured locks nicely to make the wearers hair look fabulous, and a soft center part is all that she needs to create an incredible look. 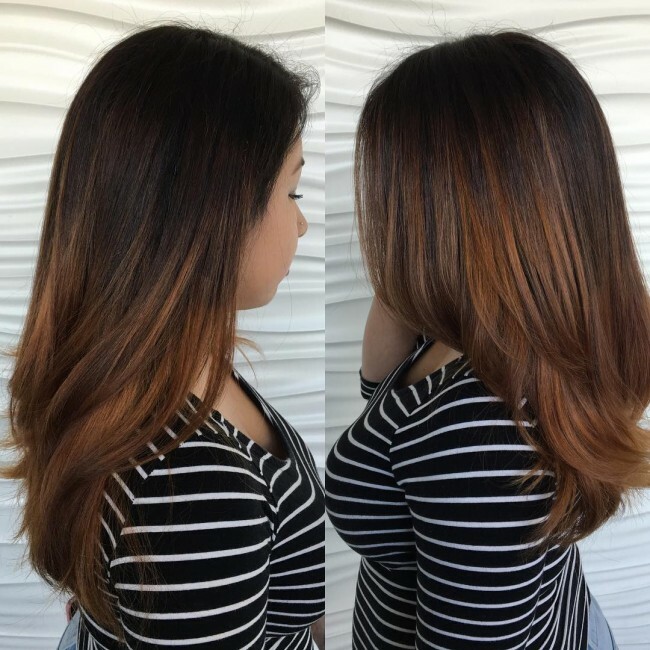 Long hair deserves some beautiful colors at least if you want it to look outstanding. 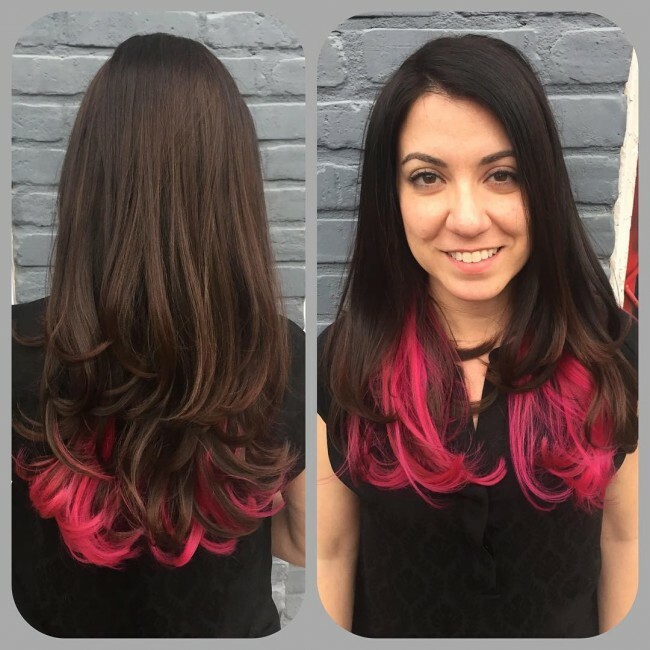 In this design, the long locks have a fantastic pink peek-a-boo design that creates a lovely contrast with the natural black locks. The contrast and the waves on the tips of these long locks are what make this a fantastic headdress. You do not have to try hard to create lovely highlights for black hair since it will look good on almost anything. The peacock inspired shades in this headdress prove this, and they are simply a color blend of purple and blue on a small section of the locks at the back. And the good thing is that you can quickly cover them if you wish to by simply brushing your strands to the back. 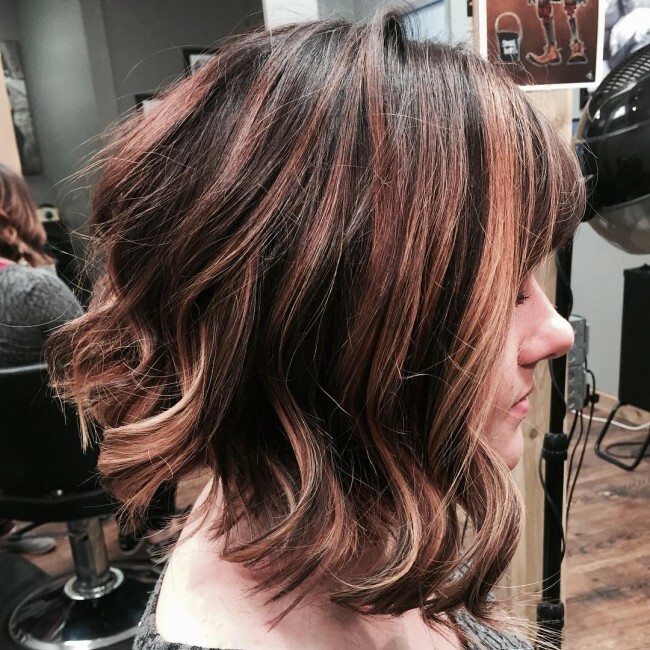 An angled bob may be a fantastic style, but it will look more appealing if you brighten it up with some lovely shades of brown and blonde like in this style. Here the highlights are hand painted not only to brighten up the style but also to give it a natural finish. 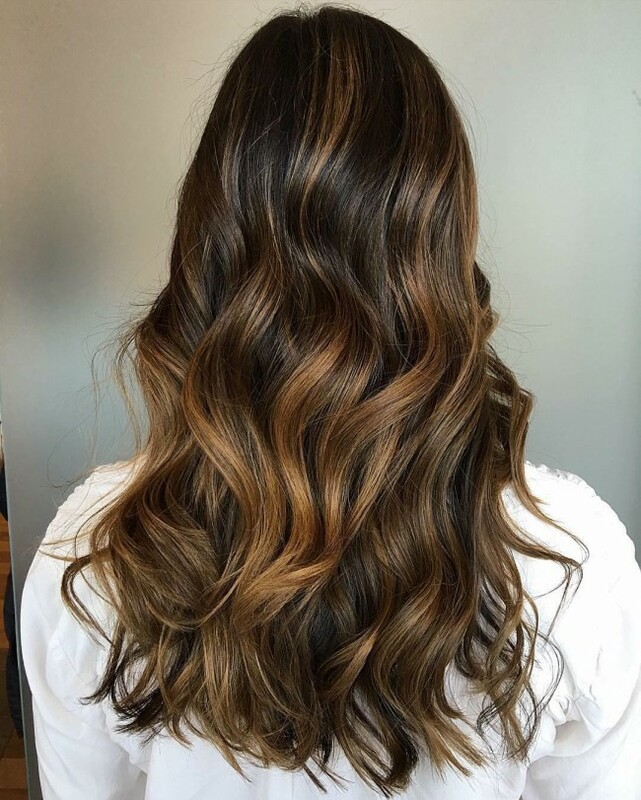 There are many ways you can wear caramel hair but if you want it to look as silky and smooth as this one you have to hand-paint your strands. 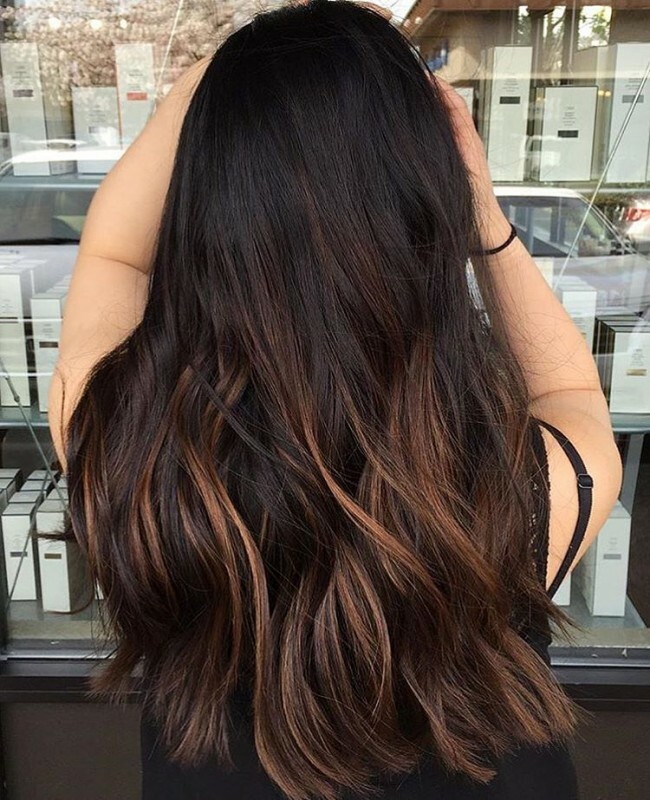 Apart from the perfect balayage job the other things that make this a lovely headdress include the contrast the caramel creates with the black base and the waves on the ends of the locks. The dazzling effect of these locks will turn heads everywhere you go and although it may look like a very sophisticated hairdo it only requires some creative color technique. To replicate the look, you should hand-paint your strands in a Sombre pattern and use a silver hue on the lower half of the hair. Some ladies have a fabulous natural hair, and so it is easy for them to look good with a simple style. 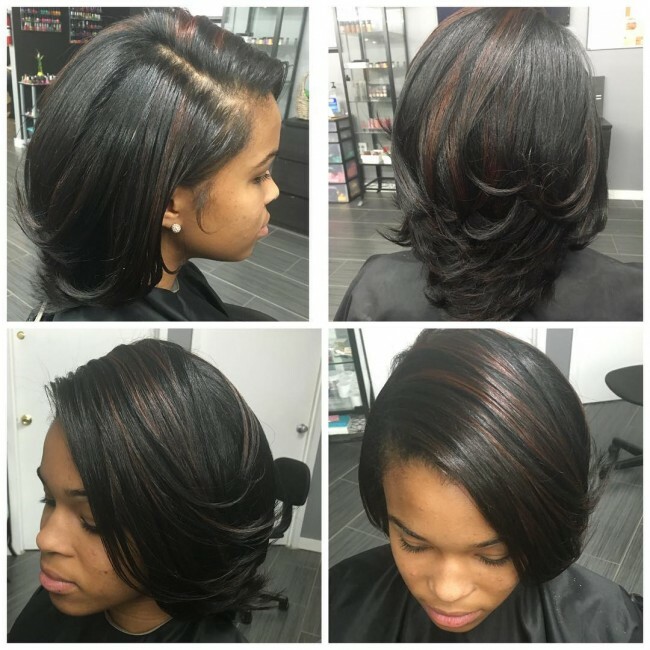 This particular one is a perfect example of a lovely natural black hair, and it has some fabulous reddish highlights that make the layered locks look exquisite. And their attractive shine also complements the design. Styling your locks is what determines how beautiful it will look, but the color also plays a significant role in creating a top notch headdress. This hairdo demonstrates how you can style your strands creatively with an updo to make it look voluminous and a braided headband to give it some class. However, the brown highlights on the hair also help to spice up the design. No modern woman would say no to these trendy waves, and this is especially those who have natural wavy black strands. 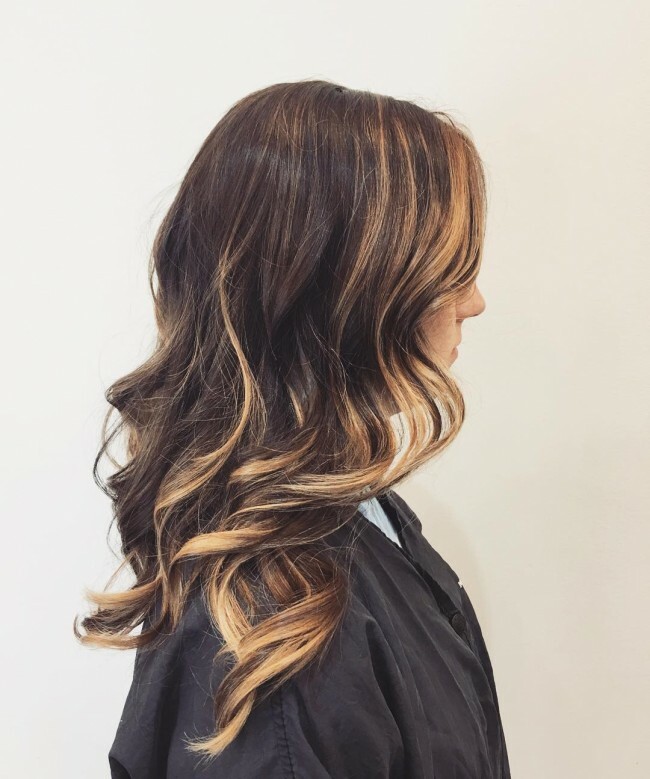 Although the waves and the texture in the locks are enough to make it look fabulous, the hint of caramel highlights is vital as it gives the style an extra dimension. This hair has a very natural tone, and it is hard to believe that it has a dye job. 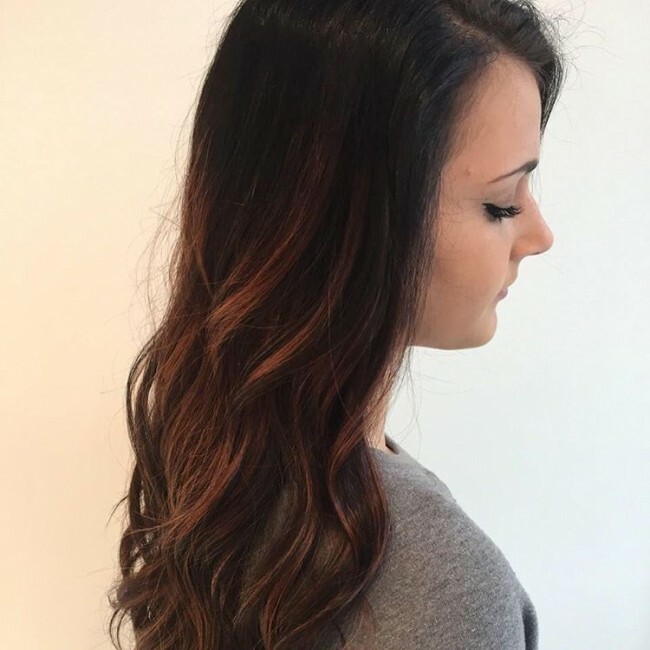 It is a product of balayage coloring technique, and it blends in some lovely dark brown hues into the black hair to create a very natural look. 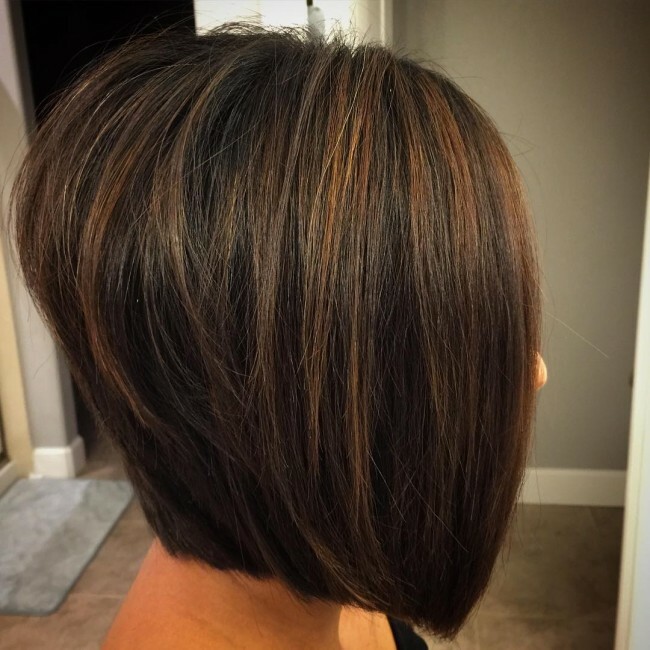 A bob cut may seem very ordinary, but it is also very versatile since you can spice it up to create a very distinct appearance like this one. Here the bob cut gets some subtle partial blue lowlights at the front to make it a lovely hairdo that any woman would want to try out. 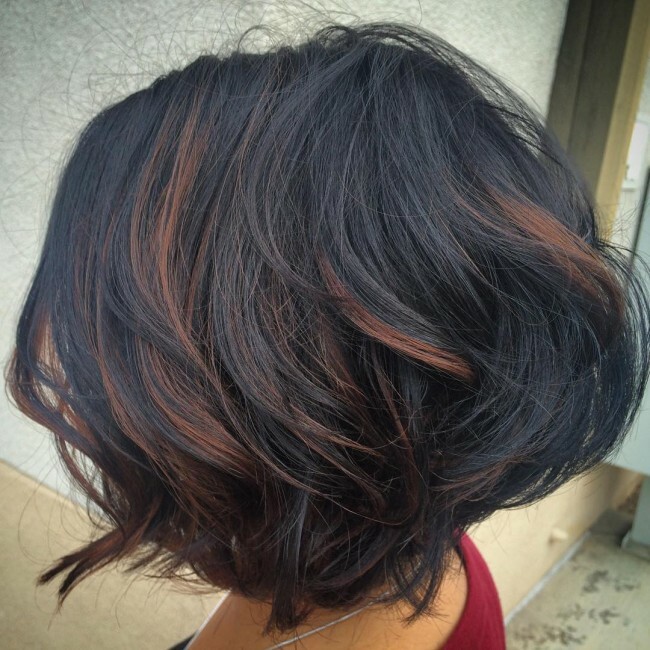 The moderate peek-a-boo brown highlights and the shine on the strands also help to spice up the bob. The options for highlights for black hair are almost unlimited, but if you are bold enough, you can try these neon hues on your curly locks. Multicolor designs are very common nowadays, but this one uses dazzling shades of blue, green, pink and yellow on a black base. The bright shades create a look that will make your curly strands stand out, and so you can be sure of drawing some attention. This headdress is another example of the versatility of a bob cut, and apart from its edgy blunt cut it also has a perfect hue. 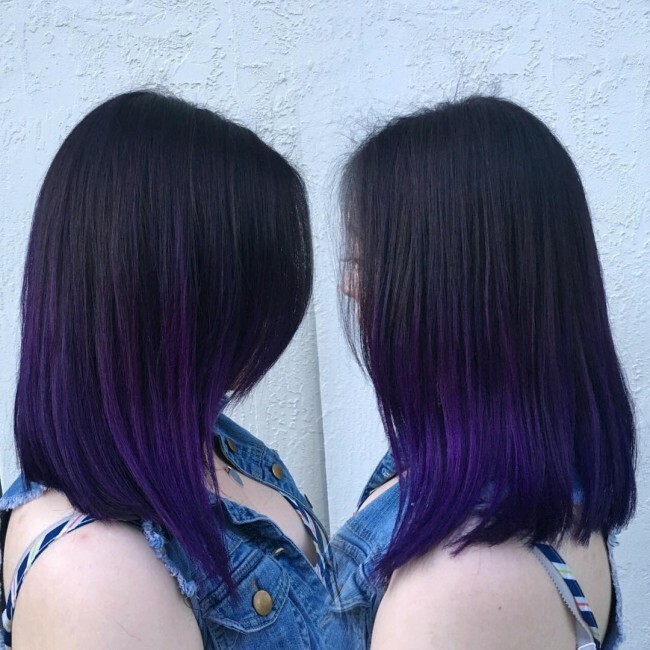 Although the base color is black the most dominant hues on the hair are lavender and purple, and they have a soft color blend that helps to give the bob its unique tone. Black hair does not need bright highlights to look fantastic since you can still get an outstanding look even if you keep things dark. This headdress is a perfect example of this, and it comes from hand painting a dark brunette tone on the natural black hair to create a distinctive design. However, the length of the locks and their subtle waves also help to make this a fresh style. Although this headdress is a typical peek-a-boo design, it looks like a different style due to how the color is applied. 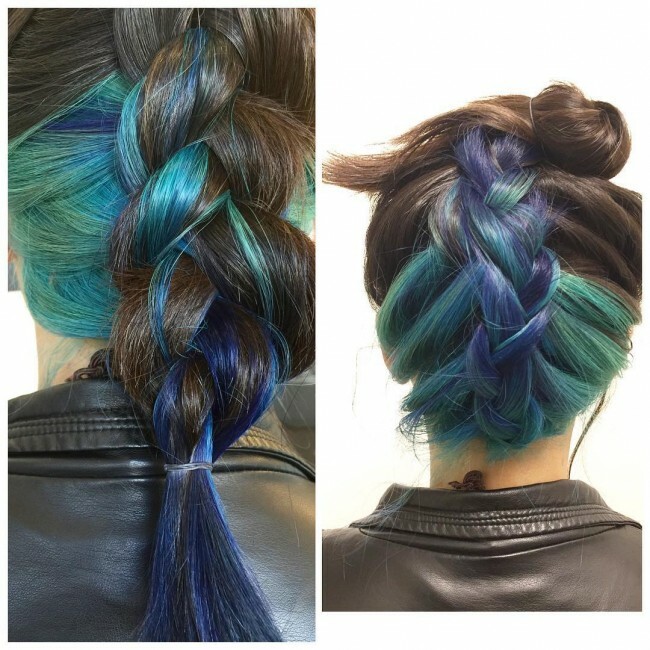 The unique shade of blue is on the strands at the back, and so it creates a lovely contrast when you brush them to the back. 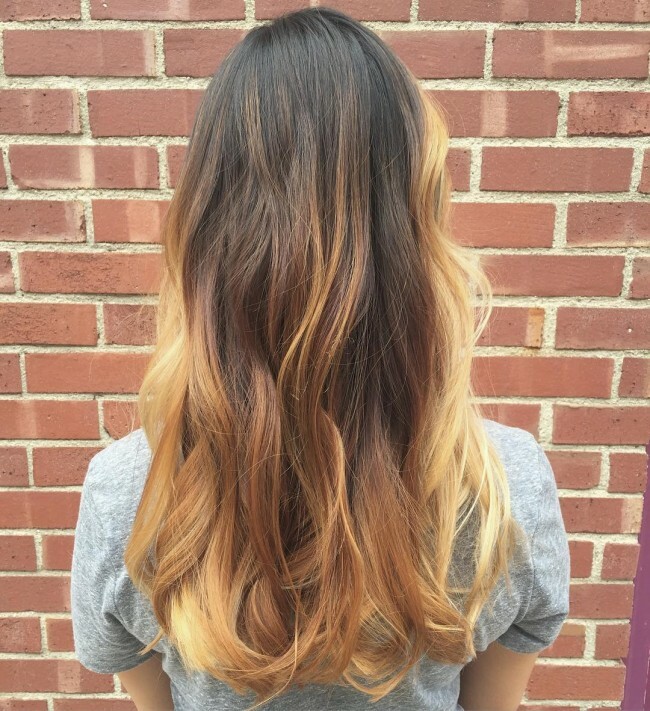 However, you can only replicate this design by using a balayage technique. 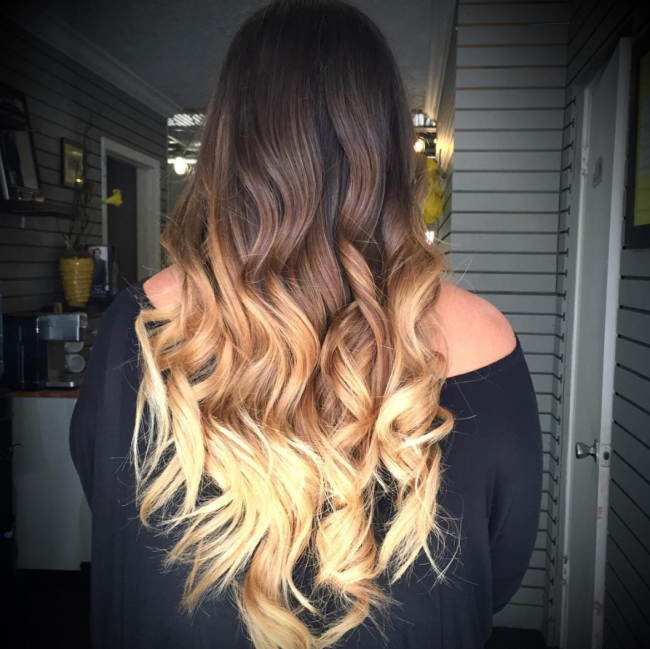 If you like ombre designs this particular one will fascinate you as it is perfect in length, color choice and most importantly the dye job. The shades used in the style are dark brown and blonde with the former being the base tone and transitioning to the lovely blonde hue. Apart from the color the hair also has some subtle curls. Some bright highlights will make your hair look lighter in both color and weight than it is. If you have some long locks like these, you only need to curl them with a curling iron and then style with a center part. 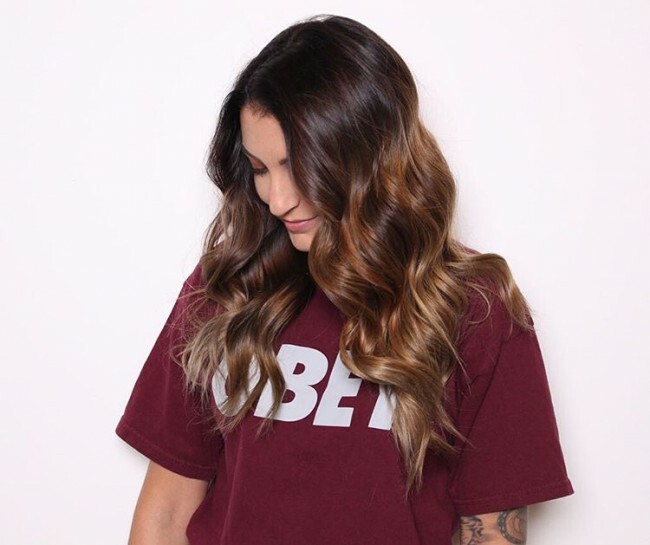 The bright ombre brunette color will give you all the beauty you need and the curls and center part are only for enhancing it. 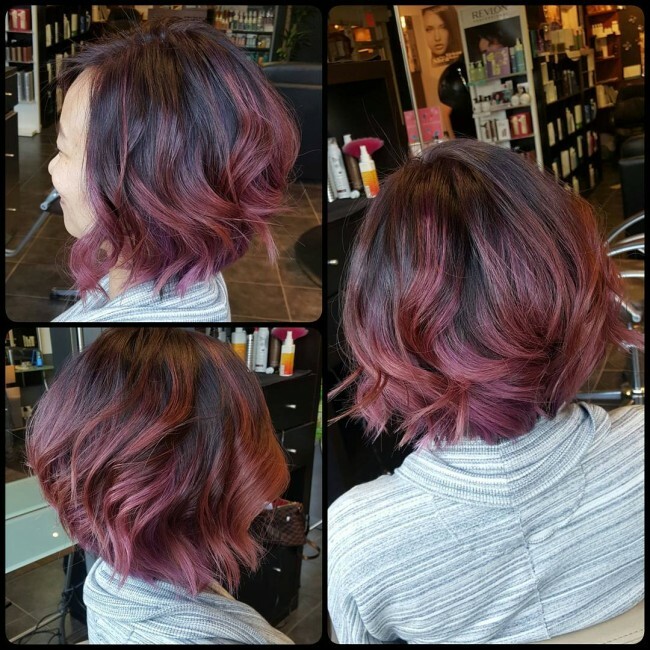 This hair proves that short strands can also look outstanding if you style it right and with a lovely color such as lavender rose. Apart from this it also has some beautiful waves and a center part to give the short strands an excellent flow. 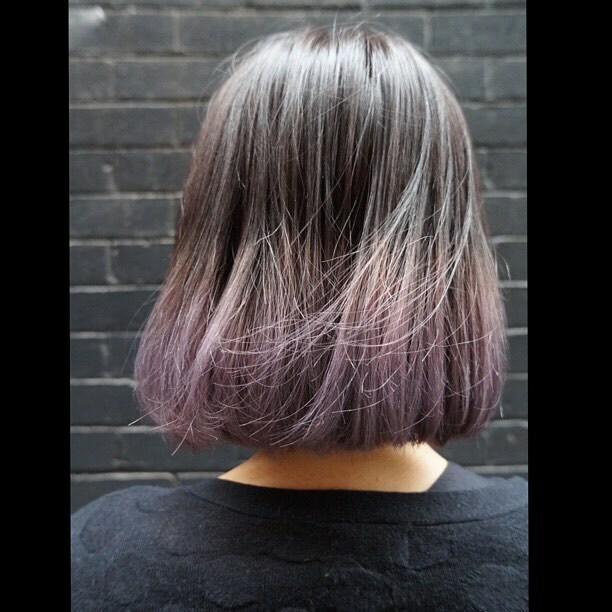 The dyeing technique is also perfect because the black roots help to create a fabulous contrast despite the lavender being the most dominant shade. 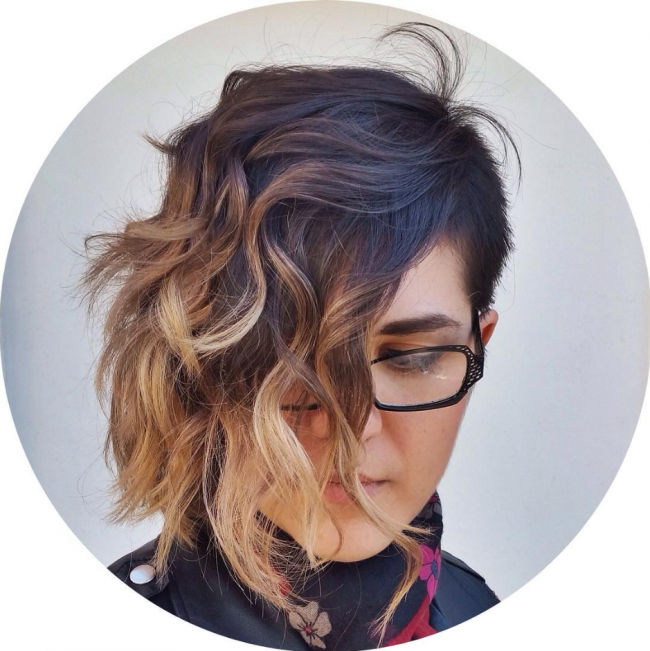 Lightening black locks is a perfect way to make it look fashionable and modern. Black hair with highlights will always be on trend, but the best thing about it is that it is very natural. And if you prefer to keep free flowing locks like in this headdress the highlights will give you some extra texture and definition. This design is perfect for summer due its colors and texture. There are several colors involved in creating the design, but the most dominant ones are dark brown and blonde. The way they blend in and their ombre pattern are what make them perfect. 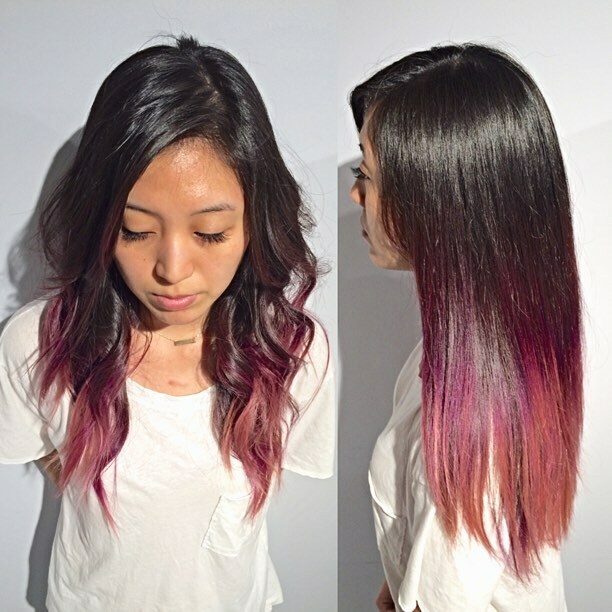 Although it is not a pure ombre with a drastic color transition, the shades still create a perfect blend. A while back most women would not go with a gray tone as they thought that it was a sign of aging. However, in this modern era, it is a trendy hue that will make a woman stand out and look very stylish. In this particular style, the gray shade creates a fabulous ombre design, and the hint of white enhances it in the lower half of the headdress. Some high contrast will also make you look fabulous even if you have some partial highlight like the caramel blonde in this headdress. The highlights are hand painted to create an incredible hairdo. And the fact that the strands also have a brushed out pattern helps to enhance their appearance. The transition from the natural black hair to the brighter lower section is amazing, and it is what makes this style stand out. However, the color choice for the bright hues is also perfect because red and pink create a lovely color blend that helps to spice up the appearance of your hair. 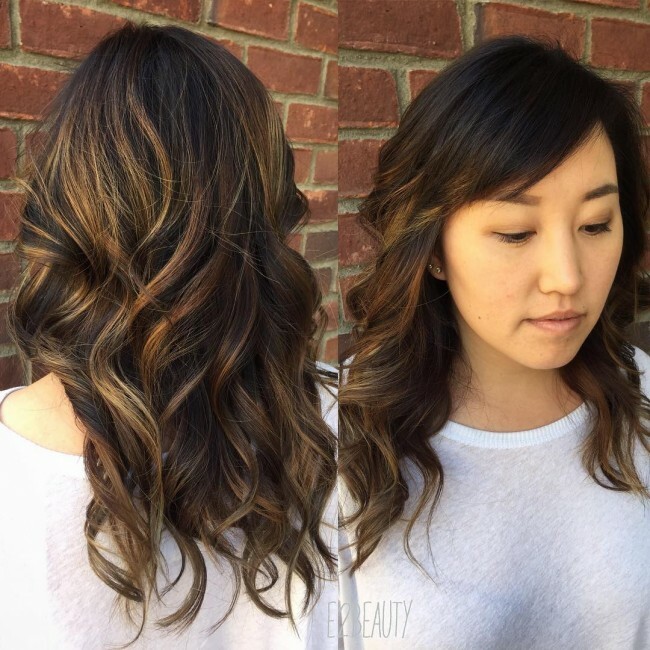 This balayage touch up will tempt you to change your hair color as it looks splendid. The beautiful appearance of this style comes from the lovely streaks in the black hair. You can highlight black hair with any color but the brown and blonde color melt creates amazing streaks, and they are the shades that you should use if you want to replicate this particular headdress. Caramel is not a widely used shade by chance because it can change how you look by breathing some life to your dark locks. In this particular style, it makes all the difference since these would just be some ordinary long locks without it. However, the brushed out appearance of the strands and the fact that they have a natural black base also helps to make them lovely. 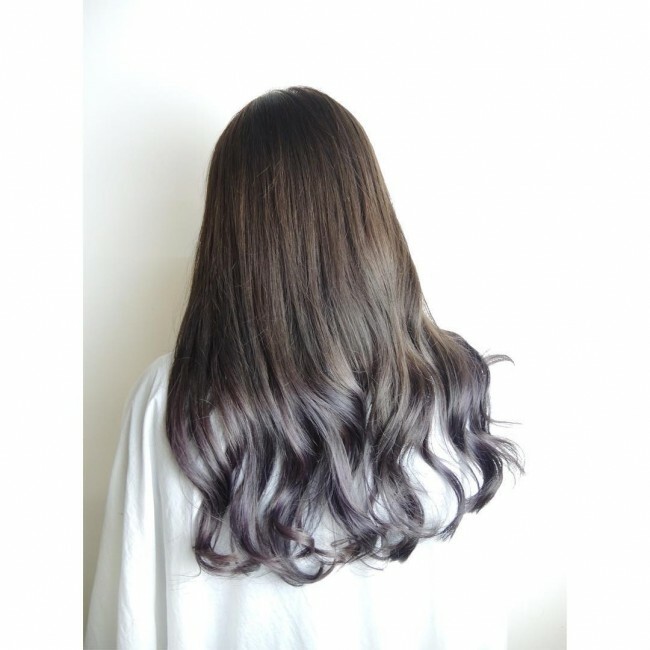 The soft purple baby lights in this hair show just how splendid purple can be on your black hair if you use it inventively. 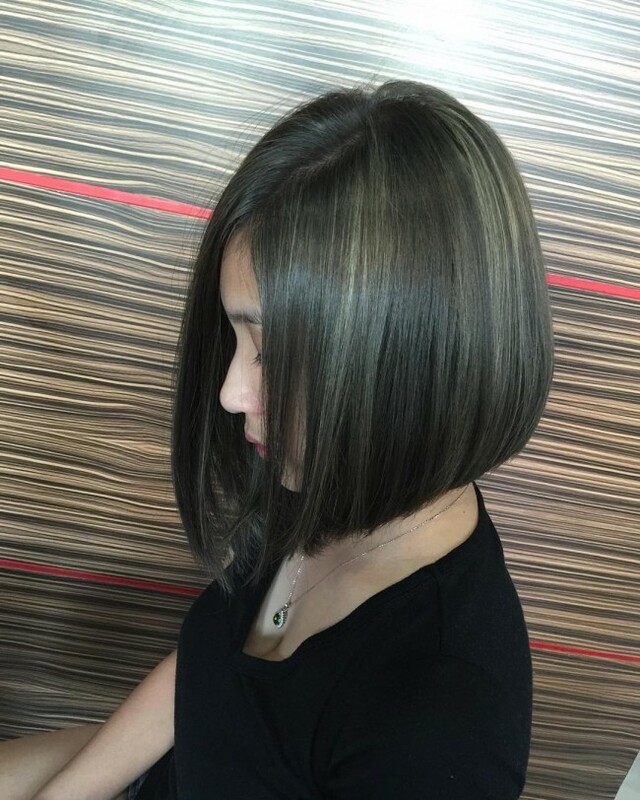 Although it is a bright hue, it is utilized in this design moderately and in a Sombre technique to ensure that the hair maintains and overall dark tone. 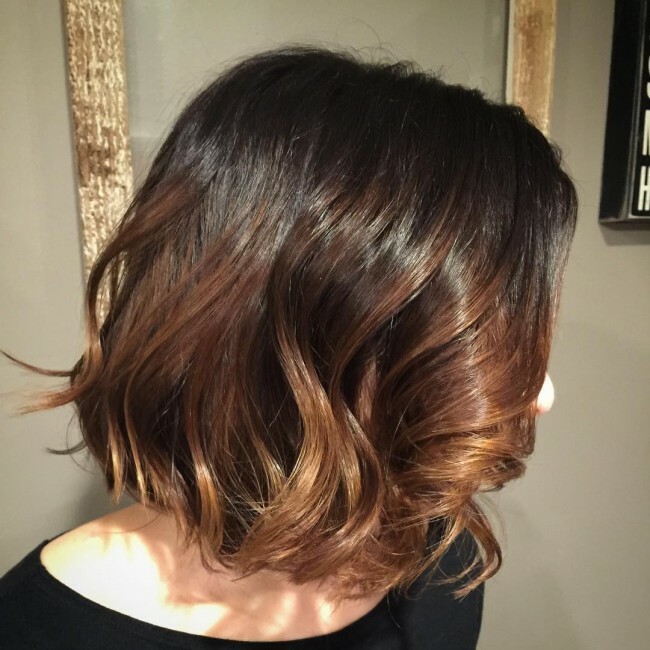 Apart from the perfect color choice and pattern the strands also have a lovely long bob haircut. Black hair is the best with highlights, and it gives you the opportunity to wear any color that you can think of and still look fantastic. 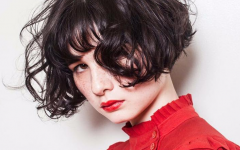 Whether you have long or short locks highlights will still work for you but just like with any other color you still have to get a good haircut and also style the strands creatively. 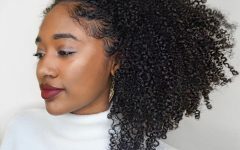 However, if you are not sure of how to highlight your black strands the following 55 hairstyles will give you some inspiration on what you can try out.